Robert II and Euphemia Leslie. From the Forman Armorial, 1562. 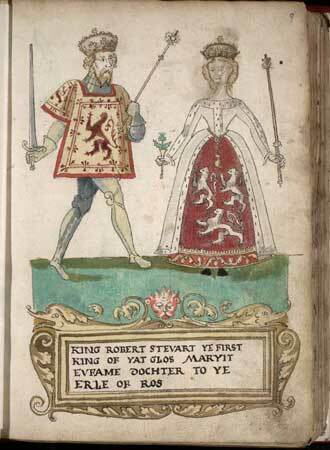 Robert III, King of Scotland, reigned 1390-1406. Marjory Stuart, mar Sir Alexander Keith and had issue. Elizabeth Stuart, mar Sir Thomas Hay and had issue. mar 1380 to David Lindsay, 1st Earl of Crawford and had issue. Egidia Douglas, mar Henry Sinclair, 2nd Earl of Orkney and had issue. John Stewart, Sheriff of Bute, "The Black Stewart", born 1360, illegitimate. died 1390, age 74 yrs, bur Scone.